The company has targeted to buy land that can generate gross development value (GDV) of RM5 billion. Mah Sing Group Bhd, one of the country's top developers, has bought 172ha of land in Bandar Baru Bangi, Selangor, for RM333.26 million, or RM18.55 per sq ft. The group acquired 170ha of freehold land from Boon Siew Development Sdn Bhd and around 1.6ha of leasehold land from an individual party. The land acquisition is the third for Mah Sing this year. This means Mah Sing has achieved 73 per cent of its landbank target for this year. For the latest acquisition, Mah Sing intends to develop Southville City in a few phases. Southville is expected to generate GDV of RM2.15 billion and it will be completed over the next five years. The first phase of the gated and guarded project will offer affordable homes for young families, mainly double-storey-link houses, indicatively priced from RM530,000. The remaining phases will offer linked-semi-detached (semi-D) houses, semi-Ds and bungalows for home upgraders. Mah Sing group managing director and chief executive Tan Sri Leong Hoy Kum said almost 70 per cent of the houses will be offered at below RM1 million each to meet the strong market demand for bread and butter properties. Some 30 per cent of the township will comprise commercial components, mainly offices. The master layout and development order for the project had been obtained, Leong said in a statement yesterday. He said registration of interest for the properties is expected to began in the third quarter of the current year. 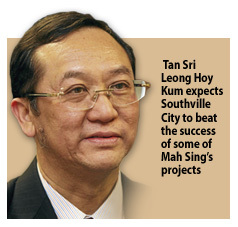 Leong said Southville City is expected to beat the success of the group's award winning Aman Perdana township in Meru-Shah Alam, M Residence @ Rawang, Kinrara Residence in Puchong and Garden Residence in Cyberjaya. With Southville City, Mah Sing now has 28 ongoing projects in Greater Kuala Lumpur. "This positions us to indirectly support the opportunities arising from the Greater KL National Key Economic Areas (NKEA) implementation, such as the additional demand for housing, as population is expected to increase from six million to 10 million by 2020," he said. Mah Sing is still scouting for prime land suitable for development to meet market demand. "The land must fit our quick turnaround business model. We are keen on privately-held and government land," Leong added. PETALING JAYA: Mah Sing Group Bhd plans to undertake the building of a mixed township near Bangi, Selangor, after acquiring 412 acres there. In a statement yesterday, it said it was paying RM333.26mil or RM18.55 per sq ft for the land. In its third landbanking exercise, 408 acres of freehold land there will be from Boon Siew Development Sdn Bhd for RM330.8mil and the remaining 4 acres of leasehold land from an individual party. Under the project Southville City, Mah Sing will provide 17,500 people with homes. Its first phase of this gated and guarded project will feature mainly double-storey link homes indicatively priced from RM530,000 onwards. About 70% of the project's residential component will be priced below RM1mil to meet strong market demand for bread and butter properties. The land is situated along the North South Highway, 3.2km from Universiti Kebangsaan Malaysia and 2.6km from the Sony plant. To allow direct access to the project, Mah Sing is planning a new interchange on the North South Highway just 2.5km from the existing Bangi interchange. Apart from the existing access routes, there are also plans to build a linkage from the Putrajaya Interchange to Jalan Kajang-Dengkil. This will further enhance access to the township. The group is still actively looking for land to add to its landbank, which must also fit its quick turnaround business model. “We want to replicate and even beat the success of our award-winning Aman Perdana township in Meru-Shah Alam and M Residence@ Rawang as well as Kinrara Residence in Puchong and Garden Residence in Cyberjaya where we have created self contained, secured lifestyle townships,” Leong added. Following this acquisition, Mah Sing has met approximately 73% of its 2012 full-year landbanking target, which is to buy land that can generate a gross development value of RM5bil. I-Bhd, the master developer of i-City, is now ready to reap the fruits of its labour as most of the major infrastructure works at i-City in Shah Alam have been completed. The group will be realising i-City's conservative gross development value (GDV) of RM3bil over the next eight years but Kenanga Reseach reckons the real GDV could be close to RM5bil. “Our computation reveals that the current total GDV guidance of RM3bil is based on average selling price (ASP) of less than RM400 per sq ft.
“We think that this is extremely conservative since recent sale of i-Residences was priced at RM500 per sq ft.
“Assuming the ASP hits a high of RM550 per sq ft, total GDV will be much closer to RM5bil,” Kenanga said in a recent report. According to the research house, since obtaining the Multi Super Corridor status in i-City four years ago, the group had been rather quiet as it was focused on completing the major infrastructure works of i-City given the onset of the global financial crisis in 2008. “Today, the group has spent some RM30mil on major infrastructure works, which means its upcoming projects are now readily developable. “Up till 2010, I-Bhd was cautious with its launches and so far, has completed only 0.6 million sq ft of gross floor area of offices, of which Al-Rajhi has bought 250,000 sq ft and the rest are currently being occupied by Maybank and Orisoft among others,” it said. It said i-City's projects would likely be completed in the next eight to 10 years and it enjoys strong state government support as i-City is positioned to improve tourism and content of knowledge-based industries, which will inevitably enhance the value of Shah Alam. The entire development, which spans 72 acres, of which 15% has been developed, is one of the few large freehold land banks in Shah Alam. According to Kenanga, i-City's annual GDV was expected to be between RM450mil and RM500mil, based on 1 million sq ft of gross floor area per annum. The group has just launched i-Residence with a GDV of RM230mil at an average selling price of RM500 per sq ft. It features mostly service residences and some duplex units. The take-up rate has been extremely encouraging at 65% since the launch in March, which could be due to the attractive unit pricing of RM320,000 to RM650,000 per unit and also the attractive financing packages. “For the remaining part of the current financial year ending Dec 31 (FY12) the group will be launching its Sovo/Soho project at i-City with a GDV of RM200mil, which will likely be priced similar to i-Residence,” it said. Kenanga estimated FY12 to FY13 net profit at RM11.4mil to RM24.3mil, which would yield more than 100% year-on-year growth each, based on targeted FY12 and FY13 property sales of RM225mil to RM270mil. The research house also noted that I-Bhd had zero gearing balance sheet and had maintained a net cash position for the last five years. Bandar Raya Developments Bhd (BRDB) registered a pre-tax profit of RM17.492 million for the first quarter ended March 31, 2012, from the RM7.818 million posted in the corresponding quarter last year. Revenue for the three-month period also grew to RM155.042 million from RM137.185 million previously. In a filing to Bursa Malaysia today, the company said the higher revenue is mainly due to higher earnings from its property and manufacturing divisions. The jump in pre-tax profit is fully contributed by the property division, and despite a loss of RM1.8 million from the manufacturing division under Mieco Chipboard Bhd (MIECO), the company said. Moving forward, BRDB said under its property division, the company has planned several launches in Kuala Lumpur and Johor, which are at various stages of readiness to market subject to obtaining the necessary regulatory approvals. Meanwhile for its manufacturing operations, BRDB said MIECO is experiencing a more challenging market for particleboards and related products in view of the external uncertainties as well as higher raw material costs, resulting in compressed margins. "MIECO has expanded its downstream facilities to cater for more value-added and environmentally-sensitive products, which are rapidly becoming the global market preference, particularly in markets like Japan. "The resilient property industry continues to support domestic demand for particleboards and its related products," it added. KUALA LUMPUR: Impiana Hotels & Resorts (IHR), operator of Impiana KLCC Hotel, will take a 20 per cent stake in the owning company Heritage Lane Sdn Bhd. It expects to sign a share sale deal with Heritage Lane, which is a wholly-owned unit of KLCC (Holdings) Sdn Bhd, within a month. "We are finalising the deal," IHR chairman Datuk Seri Farouk Abdullah said at the official launch of the new RM100 million 188-room wing. Farouk had first mentioned that it was negotiating to buy the stake in 2005. To a question on how much the stake would cost, Farouk said it was being finalised. IHR also owns and operates Impiana Resort Cherating, Impiana Hotel in Ipoh, Impiana Koh Samui, Impiana Phuket Cabana Resort and Impiana Private Villas Kata Noi, among others. Meanwhile, group chief executive officer of KLCC Group of Companies Hashim Wahir said Heritage Lane hopes to be able to see return on investments earlier than the usual seven to 10 years taken by a new hotel. This is because the hotel's occupancy is strongly supported by events held at the Kuala Lumpur Convention Centre. With the addition of the new wing, the hotel has a room inventory of 519. Meanwhile, Kuala Lumpur Mayor Tan Sri Ahmad Fuad said that the development order had been issued for the Malaysia Truly Asia Attraction, which forms part of the Greater KL initiative. He said that it was in the midst of relocation some 32 residences from the area. Kuala Lumpur City Hall, in partnership with Themed Attractions Malaysia, will open the world-class cultural attraction in 2014. Malaysian Resources Corporation Bhd (MRCB) recorded a 48 per cent hike in pre-tax profit to RM35.6 million for the first quarter ended March 31, 2012, from RM24 million in the same quarter last year. Revenue also rose to RM328.6 million versus RM221.5 million, the company said in a statement today, citing strong contribution from its property division due to progressive works at Kuala Lumpur Sentral for the higher profits. Recurring rental income from the newly completed KL Sentral Park office also contributed to the improved results for the current quarter. The newly completed KL Sentral Park office, the group’s latest property investment addition continues to attract encouraging interests, with tenancy expecting to reach full occupancy by this year, MRCB said. Ongoing construction of CIMB Tower at Lot A, Shell Tower at Lot 348 and the integrated Nu Sentral retail mall, three office towers and one block of hotel at Lot G were progressing on schedule to complete within this year. The Eastern Dispersal Link Expressway in Johor Baharu was opened to traffic on April 1, 2012 while negotiations with the government for toll collection are still in progress. Among the group’s major construction works, the Ampang LRT extension line project commenced work late last year. PETALING JAYA: Land & General Bhd (L&G) is providing up to A$2.5mil (RM7.8mil) to its 50%-owned subsidiary Hidden Valley Australia Pty Ltd (HVA) within the next 12 months as financial assistance for a proposed retirement estate project in Melbourne. The property investment and development firm told Bursa Malaysia recently that the proposed retirement estate consists of 298 residential units, built as standalone and duplex-style accommodation, with the average selling price at A$456,000 (RM1.42mil) per unit, which is expected to generate a project surplus of A$60.1mil (RM187mil). HVA is in the midst of obtaining approvals from the Australian authorities to start the proposed project in the second half of this year. The project, expected to be completed in March 2023, will be built in 10 stages. Each stage is expected to take 12 months. The total gross development expenditure is estimated to be A$116.2mil (RM362.2mil), which primarily will be funded with bank borrowings and internal funds or collections from progress billings. L&G said that due to current market sentiment, banks were only willing to extend facilities if there were similar commitments shown by shareholders. “Therefore, the availability of the financial assistance is crucial during the early stages of the proposed project. Both joint-venture shareholders of HVA will provide advances proportionate to their respective shareholdings,” it said. L&G has a 50% stake in HVA via wholly-owned subsidiary Land & General Australia (Holdings) Pty Ltd or LGAH, with the other half owned by HVA director Craig Williams. L&G said the financial assistance was for working capital and preliminary expenses for costs including advertising and promotion, project consultancy and overheads. The financial assistance for HVA is without any specific repayment timeframe or interest, and will be funded via L&G's internal funds. L&G also said any additional financial assistance to be provided above A$2.5mil (RM7.8mil) would require L&G shareholders' approval once it exceeded 5% in aggregate. The proposed retirement estate is part of the 2,500-acre Hidden Valley development. According to the website www.hiddenvalleyaustralia.com.au, the development is a 50-minute drive to Melbourne's central business district via the Hume Highway. The attractions include an 18-hole golf course and a country club.